Toddlers are such a funny bunch. They are fiercely independent, though don't have the skill set yet to do much completely on their own. Of course, if you try to help them they get mad, and if you let them alone, they get frustrated and mad. It's a no-win situation...or is it? Helping a toddler gain a sense of independence and accomplishment doesn't have to be an uphill battle, if you know how to manipulate their choices a bit so that they always come out a winner. For instance, my daughter has recently taken to dressing herself. She wants to pick out her own clothes and put them on "like a big girl". I want her to enjoy fashion and choose her own clothes each day, but I also still want her to look adorable. Thankfully, Barbie has created an entire line of toddler clothing, available at Walmart, that will satisfy both little girls and their parents. Keep reading to learn more! 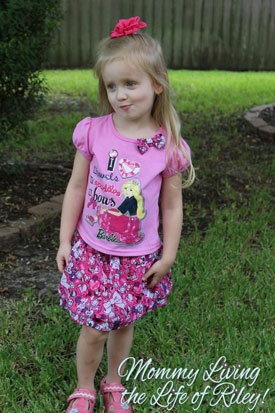 The Barbie branded collection is available at Walmart, comes in sizes 2T - 5T and retails for $5.00 to $14.99. When I first saw the Barbie collection of little girls' clothing at Walmart, I was immediately impressed at the myriad of girly accents included in each of these pieces. For instance, the three shirts we received all had puffy cap sleeves, glitter elements and jewel graphics galore. There were bows, hearts and Barbie a-plenty and my daughter loved every bit of it! The bubble skirt was my favorite selection from the Barbie collection, for it was light and airy and looked "poofy" all the time. It also had plenty of jewels, hearts, ribbons and bows throughout and the myriad of colors used in this skirt ensured that it would match virtually any top Riley owned. 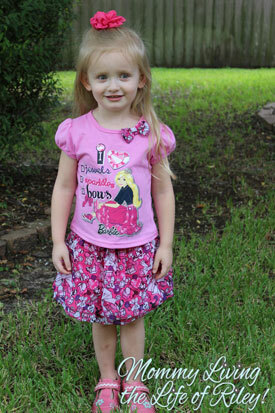 It even came complete with a pink set of shorts sewn underneath the skirt, so that she could run, jump and play. She's a huge fan of Barbie and enjoyed all four pieces we were sent. I was surprised at just how affordable each of these toddler fashions were. When the most expensive item costs only $14.99, it's easy to purchase many pieces from this collection so that your little diva will have fun mixing and matching them together. Finally...Riley just being her regular self! Here's my 3.5 year old's attempt at "walking the catwalk" in her favorite Barbie ensemble that she selected herself! If you'd like to find an agreeable solution for that fierce toddler independence, try any of the affordable and stylish fashions from the Barbie collection at Walmart! 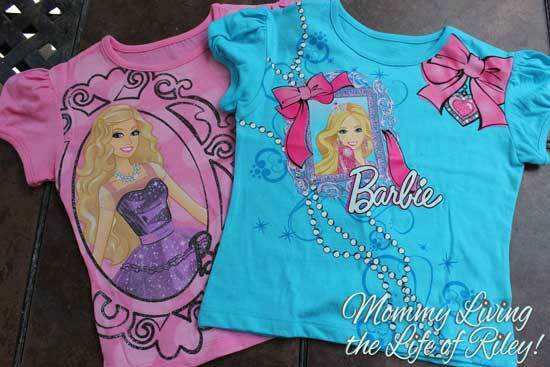 Disclosure: I participated in a campaign on behalf of Mom Central Consulting for Barbie Clothing. I received a sample package to facilitate my review as well as a promotional item as a thank-you for participating.